Perhaps the only independently intelligent thing director Clea DeVall did when filming her debut was to cast Melanie Lynskey as the hands-down lead. Not only is Lynskey the central figure to the story in many ways, she’s also the most talented actor in the bunch and the most capable of taking the entire project onto her shoulders. That the film required heavy lifting was apparent from the very beginning, and without her, it would have fallen flat on its recycled face. DuVall isn’t actually even a director, she’s a mediocre actress who specializes in bit parts and bad movies. So, look to one figure and one figure only when the film as a whole doesn’t (surprisingly) go completely down in flames. Lynskey runs around putting out fires, both in the plot and out, the cast as an entity is at least likable, and that classic, Big Chill vibe is in full force during The Intervention, a movie that probably shouldn’t have been made but I guess didn’t turn out too terrible. Seven friends, and a Plus One, organize and gather for a reunion at a large, family owned estate in the country where they spent many a happy day, albeit an increasing number of years ago. Annie is the instigator, a fun-loving “social drinker” who is engaged but never can seem to set a date. Her fiancee is Matt, a sensitive type, a man who definitely wants kids and a family. Then there’s married duo Peter & Ruby, a high-stress power couple with large amounts of anxiety and cynicism. We also have Jessie, Ruby’s sister, along with her long-term girlfriend Sarah. Rounding out the group is free spirit Jack who has brought much-younger Lola into the fold for the party. The gang’s all here for a weekend in the country, so exciting that you’ll have to lie down, and don’t think that a little thing like a decade will be enough to fog the memories of this eclectic bunch. Actually, Annie had an ulterior motive when planning this reunion. Acting as the leader, but with support from many of the others, she has formed a sort of intervention in order to broach a painful subject. The friends believe that Peter and Ruby’s marriage is toxic, that they are no longer happy, that it would be best for everyone involved if they would just get a divorce. Sure there are kids involved, money matters, it would be pretty heartbreaking, but the majority feel that the happiness of their besties is at stake, and that desperate times call for desperate measures. You can be assured that this little stage show will not go over well, and that’s only if it ever gets brought up at all, since Annie is often too drunk to remember to start the ball rolling, while Jessie has no idea how to confront her sister about her lack of marital bliss. Well, it’s going to be an interesting three days. Melanie Lynskey can’t actually be said to steal the show, because I think Clea DuVall might have gone to her secretly and asked her to please save her. DuVall clearly didn’t know what she was doing, and Lynskey stepped up to the plate to not exactly hit the ball out of the park, but at least to draw a walk and keep the inning going. If you can’t tell, I already love Lynskey from previous experience, namely Happy Christmas and other bit parts in which she absolutely shone. She’s a Kiwi, though with her ability with accents, you’d never even know, and that talent allows her to go anywhere, be anyone. Lynskey really is a special actor, someone to keep an eye on wherever they happen to pop up. She took over The Intervention, made the film about herself, and we really ought to thank her for that, since otherwise I think we would have gotten a complete mess. The film was definitely a Big Chill knockoff, which isn’t exactly to its discredit, since many have tried before to copy that timeless movie, to varying degrees of success. Beside Still Waters is one that worked, About Alex is one that didn’t quite as much, but filmmakers are constantly trying, because they know that there’s a formula available if you can just tap into it. Clea DuVall tries here, and does well enough writing/directing/starring, her best idea being to get out of the way, to let the story tell itself, to let Lynskey be the star. Still, the film isn’t wonderful, it’s rather a good remake of a standard premise, complete with the old gang, the old problems, a weekend away, drinking, kissing, making decisions, and ultimately changing paths. We like watching that plot, to a certain extent, and are willing to forgive a few flaws, which The Intervention sure has, so there’s something here to cling to, if not something that will hold you for very long. Video – With an aspect ratio of 2.35:1 (Widescreen 16×9), the video quality of the film is fine enough not to notice, not strong enough to impress. Most scenes were shot in bright light using a lot of color, allowing the characters to demand the attention, not the visuals. Most action was set in or near the house, so there weren’t a ton of scenes that stand out as visually important. Audio – The disc was done in English 5.1 Dolby Digital, with an option of Spanish 5.1 Dolby Digital. Subtitles are available in English, Spanish, and French. The audio quality, like the video, is completely unimportant. The sound quality is fine as far as balance is concerned, but I can’t remember a single song in the background, and there’s no score to speak of either. Extras – There are only two special features on the DVD: a Tegan & Sara music video and the film’s Blooper Reel. Recommended. I was surprised that Natasha Lyonne wasn’t utilized in this film more, given that she’s probably the biggest name, since her OITNB role took off. But I can’t complain that Melanie Lynskey stood in the spotlight for the majority, with the other characters swirling around her. She was up to the task, which can’t really be said for the director, the result being an average movie with one great actress and a base that, although it’s been recycled many times, always has a place in our hearts. The video and audio aren’t impressive, neither are the extras, so the technical aspects of this film won’t stand out, but they probably were never meant to. The story is what’s important, it’s fairly enjoyable, but the movie as a whole is only OK, never wonderful. 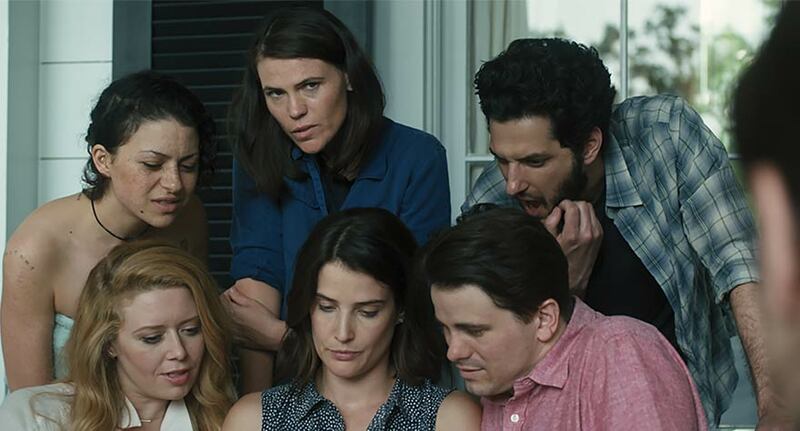 The Intervention is a mediocre Big Chill carbon copy, but its lack of success won’t stop us from watching the next one to come along.